For many years Ortlinghaus mechanical clutches have been extremely popular and problem free. They offer a free choice in terms of the selection of the friction combination and the method of generating the engagement force. They are supplied with the friction combinations steel/steel, steel/sintered lining and steel/organic lining and as a result are suitable for wet-running and dry-running, i.e. they can be used in either an open design or a closed design. 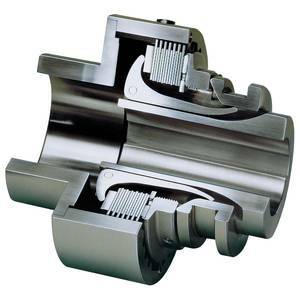 Engagement and disengagement of the clutches is by means of a “sliding sleeve” with a cam profile which is moved axially over resilient angle levers, these in turn transmit the required force to the set of plates. A limited amount of plate wear is compensated for by the resilient bending of the levers so that the torque capable of being transmitted remains constant to a large extent and adjustment is only necessary after an extended period of time. The engaging/disengaging movement can be introduced by means of hand levers, pneumatic or hydraulic cylinders or electromechanical actuation systems. 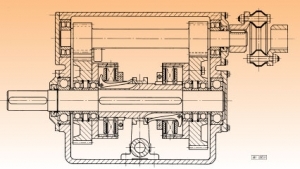 Fitting Example – Mechanically actuated Ortlinghaus Sinus® multi-plate double clutch and a highly elastic coupling fitted in a marine reversing gear. Enclosed and open forms of execution for open fitting or for gearboxes. The many different design variations of the plate stack, driving housing and actuating elements, makes this clutch versatile for all applications. They are to be found in the transmission systems of construction and agricultural machines. As a double clutch on one common clutch hub, they can be used, for example, to permit a speed change or one of the two sides can be used as a brake. Actuation rings which surround the sliding sleeve. These elements can also be used as the basic elements when designing hydraulic, pneumatic or electromechanical operating systems.